2019 women’s clothing is all about being comfortable while looking stylish and cute. These two looks from Scout and Molly’s Classen Curve will leave you looking stylish, cute, and put together. Let these looks serve as your personal stylist! In this look, you’ll be able to go from yoga to brunch to a game or gathering. In this rich tan colored sweater from Wish, you’ll be warm and cozy and look like you have a personal stylist. But if you need to transition to something cooler, you could sport the cute Social Sunday graphic tee underneath by itself. This shirt is super soft and has a fun graphic on the front, perfect for a casual football Sunday. The Spanx faux leather moto pants complete the look and bring the comfy top up a notch. But, these leggings are as comfortable as they come so you’ll look put together but feel comfortable and ready for anything. This look can be paired with numerous footwear options as well. Try booties in the fall or sneakers in the spring and summer months. It could even work with heavier snow boots in the colder times as well. This look uses traditional Women’s Clothing pieces that can be a part of your wardrobe all year round. 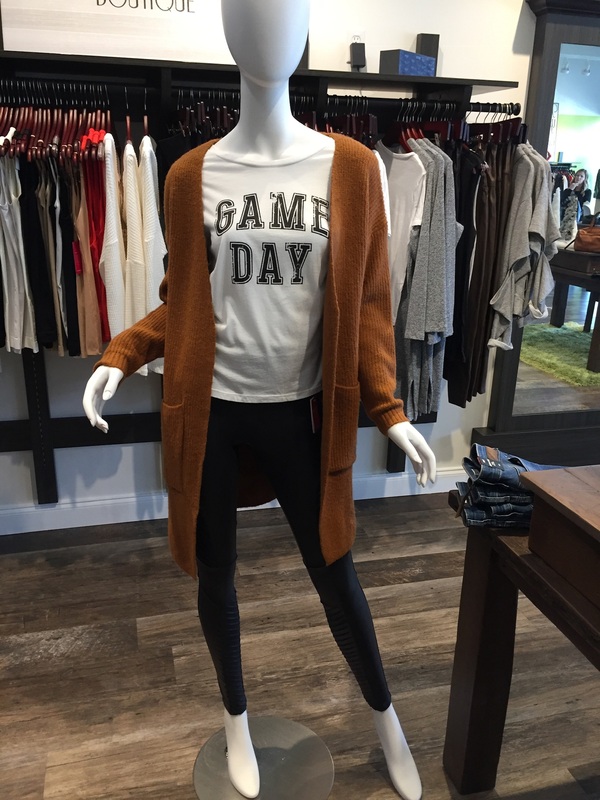 The leggings can take you through fall and winter, while the tee, a Women’s Clothing staple, can be layered all year round. The sweater can be a perfect fall and winter staple or even a stylish cover up on a chilly spring or summer night. This second look is perfect for a day at work but can be used as a great casual party look for an event like a baby shower, brunch or shopping day. The breezy Askari blouse has a bold floral pattern that can be dressed up or down. The Elan sweater in gray offers a layer for comfort and warmth and pulls the blouse and Spanx leggings together. This sweater offers interesting rib detailing and a stylish waterfall design to add interest and flair to the look. The mid-length also lets you feel covered up but not weighed down. These leggings offer comfort and style all at once. They’re opaque can be worn with many women’s clothing looks. The Lush necklace ties the look together with its bold detailing. The black tassel and bold pendant are on track to be trending this year. The bold jewelry amps this look up from basic to fashionista. This look can be elevated with pumps or wedges to add height or it could stay casual with flats or short booties. Either way, the look can go with you to numerous places and events or be your go-to work outfit. Scout and Molly’s Classen Curve has looks like these and many more for any occasion or style preference. We carry all the best boutique brands and the latest trends. We’ll also show you how to pair it all together so you can look and feel your best and most stylish.